Nice, comfy 4-rooms apartment, 90 m2, 4 persons, balcony. The apartment is on the 7th floor in the city centre on Las Ramblas at 5 minutes walk to the Esplanada and the Mediterranean sea. It is in a secure modern city building with a new lift. There is a public parking near-by. There is also a bus stop very near going to all the different parts of the city. The tranvia & the Metro at 3 minutes away going to all the main beaches of the region; San Juan, La Albufera, El Cabo, Campello, Villajoyosa, Terra Mitica, Benidorm at 30 minutes & Denia. Smokers only on the balcony, Normally no pets allowed or only a cleaned small one. appreciation D. Dagg. 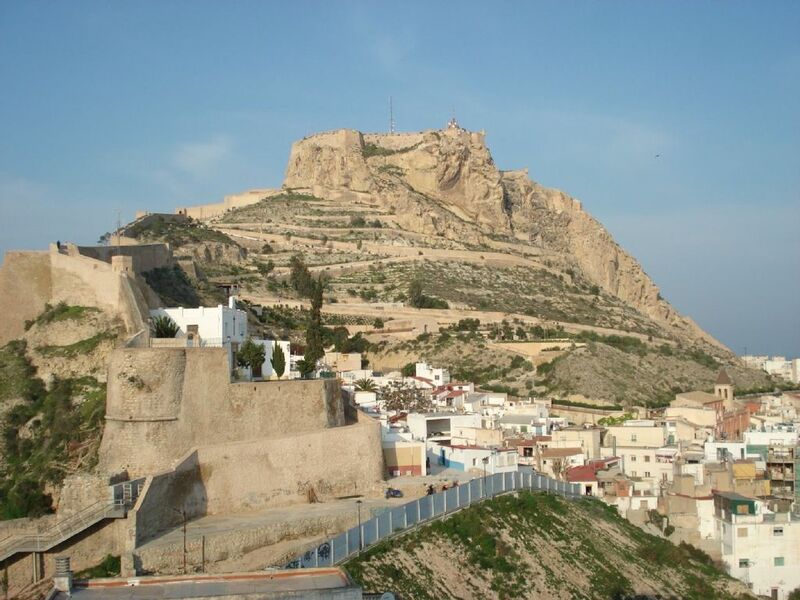 We very much enjoyed our stay in Alicante and visited most of the highlights. We found people extremely friendly and child interested. The archaeology museum was a marvel and my husband went there twice! Ella preferred the museum of the Fougeres across the street. Your apartment is ideally situated for a city-family like us and the proximity to the central market was perfect for the big breakfast we had. We ate all other meals at restaurants and enjoyed the local food very much. Your apartment was pleasant to stay in and well equipped. Thank you for your suggestion, we are planning to install a double window glasses in the coming months. My father stayed in this apartment for 3 weeks. As he is not able to walk long distances, he really enjoyed the fantastic location of this apartment. He did enjoy each day of his stay in this apartment. It is located in a very nice area, lovely avenues and plenty of shops, restaurants and cafes nearby. Easy to get the bus to go to beaches in the area. Central market very close and nice to visit. Pleasant walk to the beach. The apartment is very nice, kitchen with everything you need and very comfortable bedroom. The manager was very helpful and friendly and was there when needed to answer questions. I strongly recommend this apartment for a short or long stay. Thank you very much to the owner and manager, looking forward to coming back soon! My wife, 6 year old child and I stayed for 9 nights in July 2016. The contact was very informative and there was no hassle getting the keys. We were very pleased with the location in Alicante – located on the Rampla, almost everything needed for a good vacation is max 5 minutes’ walk from the front door: Tourist information, Supermarket, Grand marked, Tram, Bus station, Beach, Playgrounds and a wide variety of good restaurants. We will defiantly return to this apartment, next time we are at Alicante. we are very pleased, welcome back any time. very nice review, thank you and welcome back any time. Ho alloggiato in questo appartamento da metà luglio 2015 a metà agosto 2015. La casa rispecchia fedelmente le foto. Si trova al settimo piano di un palazzo sulla Rambla a circa 800 mt dalla spiaggia, vicino a negozi di ogni genere e locali per il divertimento. In casa ci sono molti utensili, elettrodomestici, carrello per la spesa ed anche due ombrelloni. muchas gracias,, bien venido, welcome any time. The city beach of el Postiguet is at five minutes walk. The district of Santa Cruz, national heritage, as it is entirely of Arab style is along the pedestrian walk. The port is at 8 minutes with boats going every half hour on the island of Tabarca. By high way for sensational beaches of white sand of Los Arenales, Santa Pola and Torrevieja. Las Hogueras de San Juan, which is the feast of the summer solstice with fireworks & fallas. The feast of Moros y Christianos in Villajoyosa & Alcoy. Other Activities: Disco, cinema, guided tours, museum, historic place like the Santa Cruz bairo. Price for 4 persons, special price for 2 persons, for retired people, for long period or for person learning or practising Spanish.